Earlier this year I decided it was time to replace my doublet with a new wire aerial. There was nothing actually wrong with the doublet, I’ve worked plenty on it but it always galled me that I had a smarttuner connected to it which limited my transmit power. I could only run 100W SSB or 30-40W using any of the data modes. Apart from anything else, it had been there since 2013 so it really was time for a change. 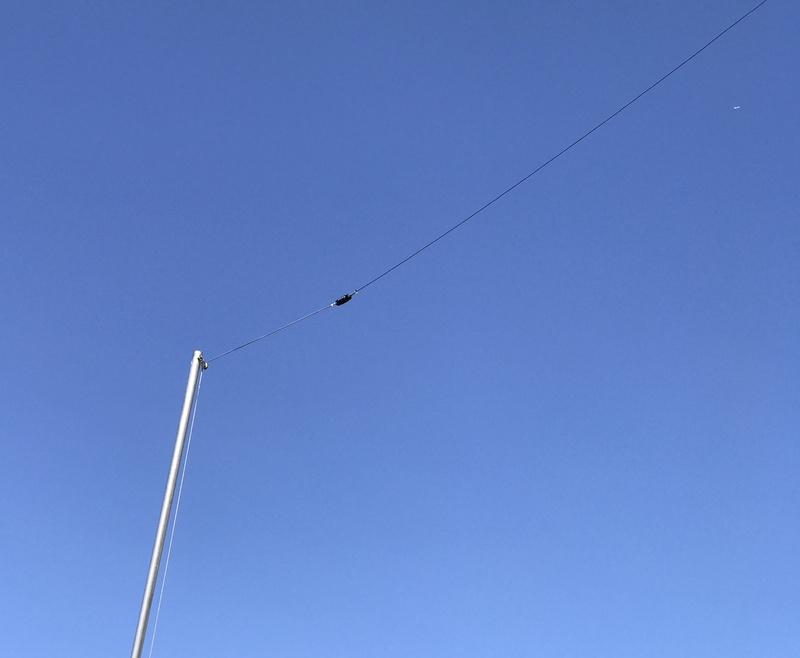 I decided to hang either a dipole for 40m or an OCFD with 40m as the main band and make sure it was capable of taking full legal power on both SSB and data. That meant having it resonant and with a good enough balun to handle the power. Logically this meant that the feed point would need to be supported because a decent balun with that sort of power handling would be too heavy and cause the feed point to sag too far if it was only supported at the ends. I also wanted to try and utilise any existing potential aerial supports in the garden and after some measuring, pacing and head scratching, I decided to go with an OCFD. An OCFD is an off centre fed dipole where as the name suggests, the feed point is moved from being right at the centre to approximately one third of the way from one end. Rather then present a 50R impedance to the wireless. this configuration presents around 200R. 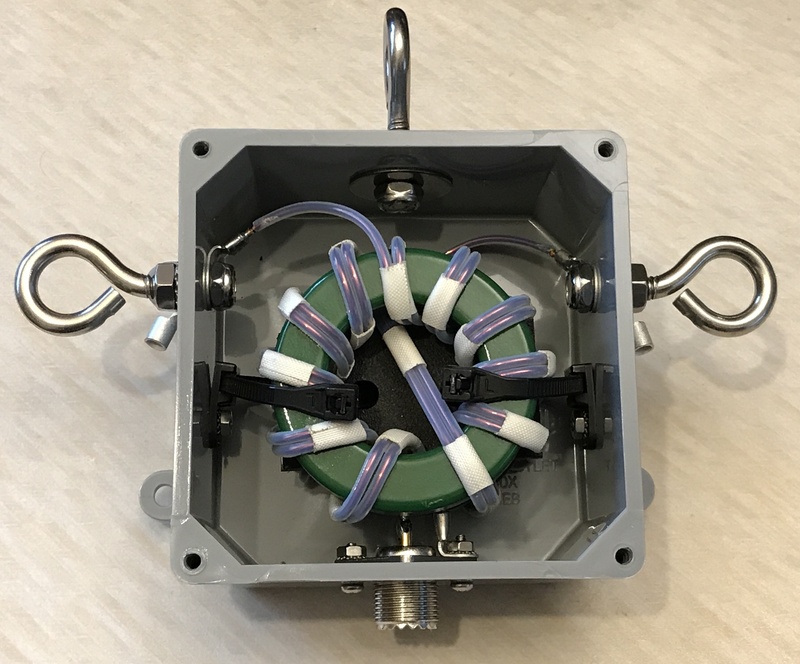 This is transformed to the more normal 50R by the use of a 4:1 balun. I appreciate that an OCFD is a bit of a compromise aerial and that I when I made one before, it was only there for a month before I replaced it but I wanted to try again. 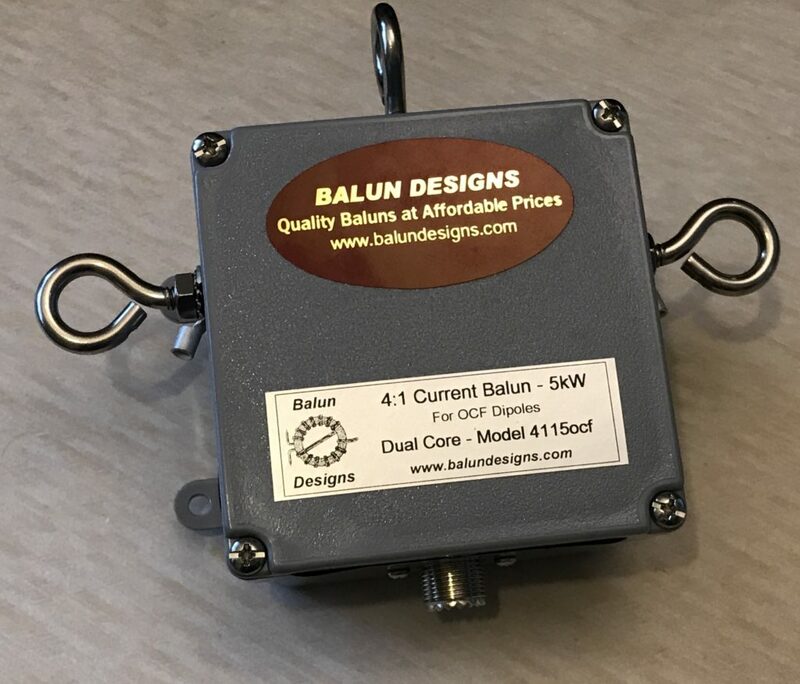 My search for a suitable balun led me again to Balun Designs. I used one of their products before when I replaced the balun on my MA-5B so I knew that they’re good. After exchanging emails with Bob, KZ5R, I ordered a 4115ocf. Unfortunately the package got held up in customs so not only was it slow to arrive but I got stung for import duty, VAT and the ridiculous ‘handling’ fee which is added on top of the other charges. This turned out to be an expensive balun. It looks good though (all the pictures in this post can be clicked for much larger versions). It looks even better with the cover off. While this was on the way, I sorted out everything else – I got myself a 20ft pole and started looking at different types of coax. It took me a while to decide what cable to buy as I’d seen a tweet mentioning a company called Messi & Paoloni who I’d never heard of before. I found their online catalogue and spent a long time poring over the huge range of cables before ordering 25m of Airborne 10. The claimed loss is really rather low at less than 0.3dB for 25m on 7MHz with a power handing of over 6.5kW on that band. At 28MHz the loss for the length I’d be using is just under 0.5dB with a power handling ability of nearly 4kW. Of course, these power levels are far more than I’m ever going to use or would want to put anywhere near a PL-259. It’s good to over spec everything. This is also one of the lightest high power/low loss cables they sell which was another good reason for choosing it. Unfortunately, when the cable arrived, it wasn’t quite what I expected. It uses an unusual material for the outer jacket, it’s not very flexible like RG213, it’s somewhat plasticy and feels like the old H100 (if anyone remembers that). Once bent into place, it stays there. It would work but I knew I’d have to be very careful when routing it in the shack. When I started getting everything ready in the garden, I discovered a big problem. I’d planned to mount the 20ft pole on an existing pole in the garden which supports a washing line but somehow, despite all my careful measuring and pacing, I realised that wouldn’t work. One aerial end was far too long for the end supports I’d planned and the other was too short. Luckily, we had another washing line support pole and this was perfectly located but it meant my feed point was now much further down the garden that I had originally planned. No real problem except the coax I’d bought wasn’t long enough. I decided that rather than buy a complete new length, I’d extend the existing run and so I bought 10m of Messi & Paoloni Ultraflex 7. I only needed to use 5m and so I made five good patch leads with what was left over. The power handling isn’t anywhere near as good as the Airborne 10 and it’s lossier but I didn’t really see either as a problem. On the plus side, this is nicely flexible and works well in the shack. With these problems overcome, I set about getting the aerial up. 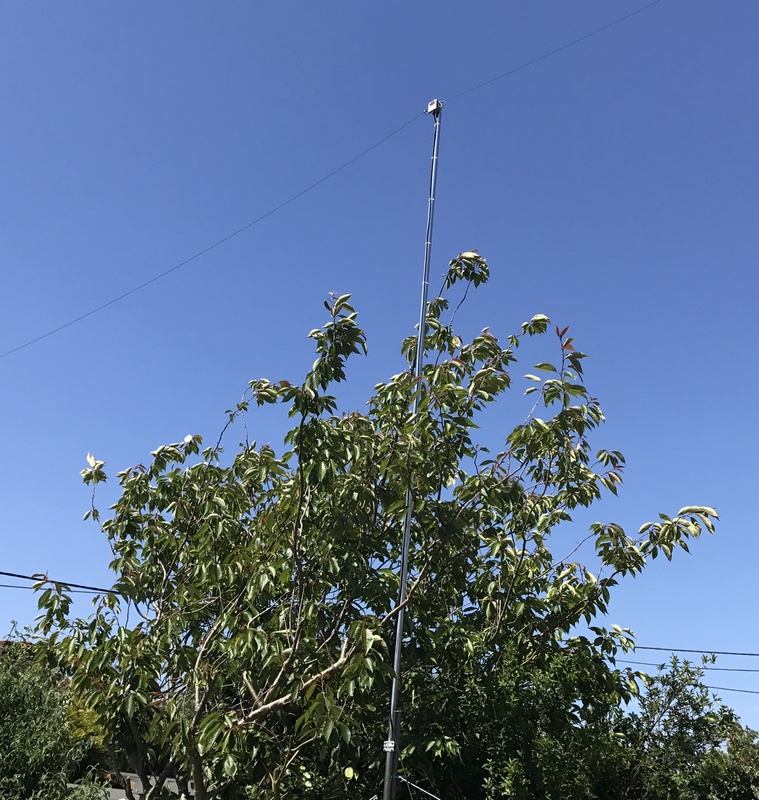 I mounted the balun to the top of the pole and also managed to extend the feed point support pole so it that it was 25ft up in the air. It also helps that this washing pole is right by a tree so my support goes almost through it. My two legs measured 12.14m and 8.28m and I didn’t change these at all once the aerial went up. You can see from this the following two pictures that the feed point was absolutely perfect here, the leg lengths are spot on for my two end points. The important question to ask after all this, is does it work? The main band I built it for is 40m and since putting it up, I’ve worked all over Europe including the Netherlands, Germany, Finland, Sweden, Italy. Hungary, Serbia, Slovenia, Romania, Russia, Ukraine, France, Poland, Portugal, Spain, Czech Republic, Denmark and many others. I’ve also worked Gabon, the USA, Iceland, Argentina, the Canary Islands, Canada and Brazil using it. I think the answer to that question is “yes, it works”! 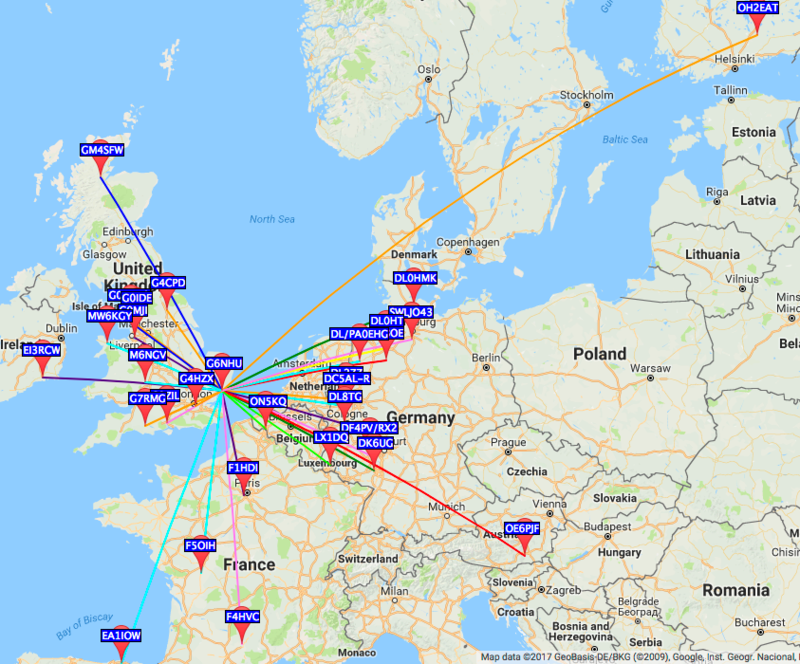 I ran 0.001W (1mW) of WSPR up the OCFD on 40m for 24 hours when conditions were absolutely dreadful and was received by the following stations. 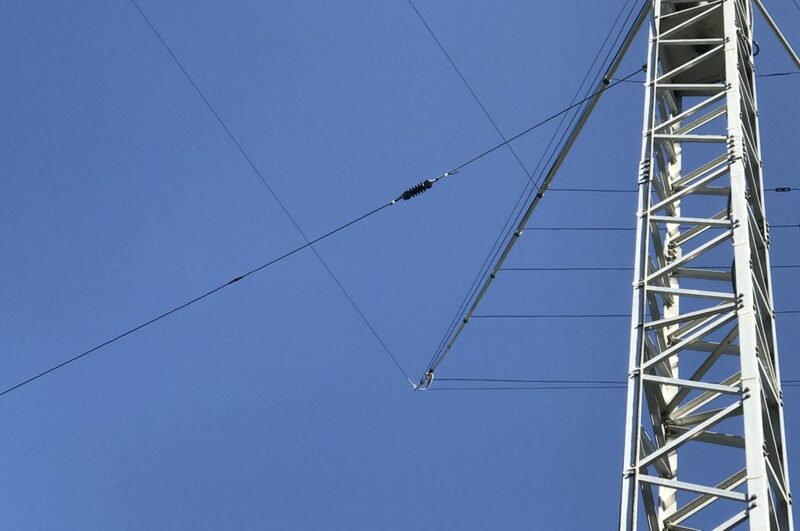 This entry was posted in Amateur radio, Construction, HF and tagged aerial work, ocfd. Bookmark the permalink.